How time flies, when you’re having fun. This was a big moment for Apple. On this day a brand new product category was launched for the first time since the original iPhone in June of 2007. A new product category is something to be very excited about, solely for the reason to see what kind of impact it’s going to cause on our everyday life. When the iPhone was released, so many trends and lives have been changed and continue to be to this day. The iPad has proved now almost 4 years later that it’s doing the exact same thing. The iPad Air is my 4th iPad. I purchased the original 1st Gen the day it was released, when there was an exclusive month-long US launch. I had it shipped to a family member in Michigan and then it was brought up over Easter weekend a little bit later. For a short time I was in technology heaven – no one else around had this brand new device. It was an incredible experience, something never imagined possible. When you saw what the iPad was on paper, it just seemed like a bigger iPod Touch. But the way it was able to deliver new content that had never been done before made it feel revolutionary. There wasn’t much available during the original iPad’s lifespan. People were just beginning to figure out what it was and what it could be capable of. Most of the content you’d see on the AppStore were remade iPhone apps and games. The iPad 2 was then unveiled nearly a year later, and made a huge splash with features such as: cameras, Facetime, a better processor and a thinner profile. It still retails in stores today – truly showing it’s potential in the market. This is when people began to take the iPad seriously as a product category. The iPad went through some upgrade stages over the last couple years, adding in: a Retina display, LTE, faster processors, better cameras – the normal stuff. It wasn’t until the iPad Air was announced when it all changed. Again. A device finally becoming it’s true potential. The iPad Air is a full realization of what it’s capable of being. Even though it’s nearly impossible to imagine what a product will be in a few years, the iPad Air is what I originally visioned it as when I held the original iPad for the first time. An incredibly thin, yet rigid device capable of displaying such a high resolution image. The ability to control not only an entire home theatre system, but also lighting, security systems, computers, and so much more. The kind of integration the iPad has come to achieve in medical, science, government, and education is astounding. The iPad Air takes everything that Apple has learned from where the industry is progressing and placed it into a design that will lead the future of tablets and computing. The iPad Air features the latest A7 processor – a dual-core 64-bit chip along with an M7 co-processor for taking care of motion computing from the accelerometer, gyroscope and digital compass. This helps alleviate stress on the main processor, allowing better performance and battery lifespan. It has a 720p Facetime camera on the front, and a 5MP camera on the rear including face detection, HDR, and video stabilization. Wi-fi N with MIMO support and Bluetooth 4.0 is built-in. The Retina display on the iPad measures in at 9.7″ diagonal and provides a 2048×1536 resolution at 264 pixels per inch. The battery life on the iPad Air is what really sets it apart from the rest. Through average testing with 60% brightness I was able to achieve 15-18 hours of usage, and 2 days of standby. Even with the iPad getting thinner and lighter with every new release, they manage to raise the bar every time. With heavy usage it will still hit the 10 hour benchmark that Apple has advertised, which places the iPad at the top of virtually every chart it has been rated on. Tech specs aside, it’s not the most advanced tablet on the market – but what sets it apart is the ecosystem that Apple offers. When Apple unveils a product, you’ll notice that specs are the last thing they like to talk about. The main reason behind this is that they enjoy explaining the benefit you’ll experience from their products, rather than how fast a web page will load. Sharing moments with your family, or learning something new will always trump clock speeds and camera mega pixels. Being able to keep all your devices in sync with iCloud, the entire AppStore, and the capabilities developers and companies have achieved with the iPad is what makes it come out on top overall. The iPad Air headlines an all new design, taking cues from the iPad Mini which launched just over a year ago. 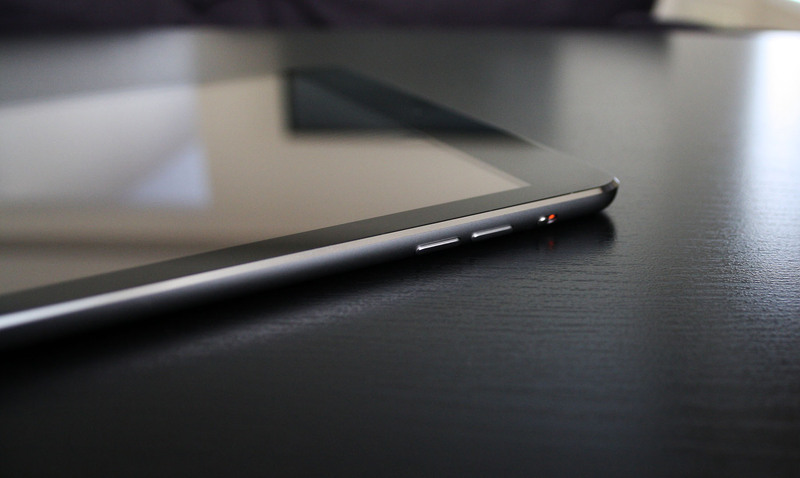 The iPad Mini introduced new screen and touch technologies, which prevented the full size iPad from achieving the thin profile and bezel-free design that the Air now features. One of the new technologies present is a touch recognition sensor that allows the iPad to know when you’re holding it versus scrolling. In previous iPad generations, they required a larger bezel so that you could hold it without having a finger on the screen. Now with the iPad Air if you have a thumb on the edge of the screen you’re free to scroll without disrupting the content. 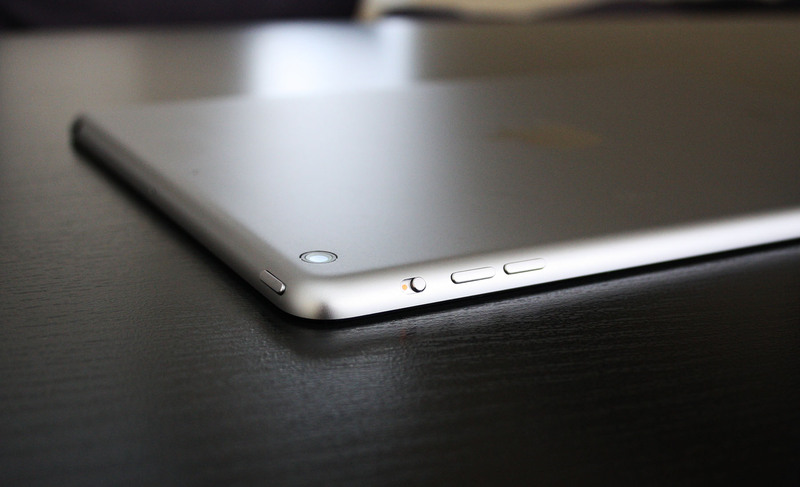 These new advancements have led to the incredibly thin profile on the iPad Air. As displayed in the ad at launch, it’s even thinner than a pencil. When placed flat on a table, it actually lines up right against the iPad Mini with Retina Display in height. The two devices feature the exact same internal specifications (aside from 1.4ghz clock speed on the Air versus 1.3ghz on the Mini), and have a $100 price difference for each respective storage capacity and cellular option. This had led to reports of cannibalization in sales for the full size iPad, as the Mini has been accepted to be more of a preferred size. I feel that there will always be a market for the full size iPad, as it serves a purpose that other tablets aren’t able to with a smaller screen. I went from the 1st Gen iPad Mini to the full size because I appreciated the larger Retina display for the type of application I had for it – streaming media and playing games. The Mini was incredibly portable, but now being in a position where portability wasn’t an important factor, the iPad Air felt like the best choice this year. One thing Apple has accomplished is the ability to merge hardware and software together. By manufacturing the product to work efficiently in conjunction with the operating system that powers it, the iPad has been able to seamlessly work into any environment with trust and reliability. The iOS platform has come a long way to where it is today, and will continue to grow with new devices and trends in technology as advancements are made. It may not be the most feature rich, but it’s consistent. There are people out there who look for an enhanced experience that allows customization, but that does bring trade-offs. To have a simpler interface brings confidence in the product you’re using on a daily basis. From working in the industry for many years I’ve seen many people who don’t care to learn the potential, and are happy just with the basics. They know how to operate the device for their own needs and nothing else. The iPad has helped an entire generation of people into the world of computing by having this simple, effective design. The iPad Air will continue to live to these expectations by providing a new era of tablets with the incredibly thin design, and powerful functionality. An impact for generations to come. The iPad will continue to change lives in ways we never thought were possible. The biggest corners of the earth – medical, science, education, and government – will adapt to more efficient ways of helping people. The entertainment world will provide more engaging ways to enrich your spare time. When I look back almost 4 years ago and see how life was compared to how things are now, it’s absolutely enthralling to picture where it’s going to be in the next 4 years and beyond. The iPad has brought so much to my life, and is part of how I am today. The iPad Air is the perfect result to what technology offers today and serves a great amount of purpose in my daily routine. I look forward to seeing where the iPad Air takes mobile computing, as more people discover what happens when you connect your life with the opportunities that are available in this world. You truly never know what app or new accessory you might stumble upon one day that will change the way you do everything.